I have been searching for strappy wedges since Spring 2011. It’s now Fall 2011 and I was happy to have found 2 pairs during the Endless.com 20% off Friends and Family sale. It was meant to be. Endless.com is really expedient. Super fast shipping – I got my shoes in 2 days! Aren’t they beautiful with the beading? It also has a zipper at the ankles. When I slipped these babies on, I thought I was walking on air. So light on my feet and it features a thick sole padding and a 1″ wedge. The caged look is all the rage lately, but I didn’t a low wedge would look this good. I was really excited to have found my pair of strappy wedges. I might just buy the Plum color too. 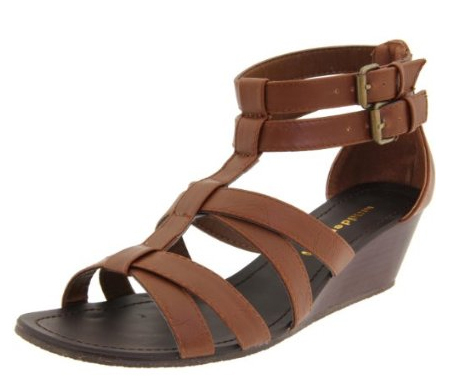 My second pair that I order is the Madden Girl Whooly Wedge Sandal. From the online picture the Tan Paris color is exactly the cut and style I wanted. Unfortunately, it came a size too large on me and was very uncomfortable. It did not have any cushioning on the footbed and the arch did not fit my arch at all. The leather material was not supple but felt rather tough and stiff. Not what I expected and I was pretty disappointed. I am waiting for the Ecco Kalac Wedge (pictured below) to be available in a size 7 though (U.K. 38). It is a lot higher but looks like there’s a 1/2 platform that will help out. I’m not going to worry about wearing sandals in Fall and Winter. I live in Texas. We don’t really experience cold weather until like 2 days before Christmas. It’ll be consistently cooler like in the 60s and that’s perfect weather for sandals still. I can’t wait to start wearing my Seychelles sandals. Now I just need to find a good outfit to pair it with.